My husband had a trade show to attend on Galveston Island, and I tagged along. It’s about 2 1/2 hours from where we live (if traffic is good). We have been there dozens of times, but I had not been back since Hurricane Ike in 2008. By now everything that is going to be fixed is fixed, and lots of new businesses and condominiums have been built, but it doesn’t look that different than it did before the storm. The biggest change is that the thousands of live oak trees that used to line the boulevards are gone, killed by the sea water that swept in during the storm. New trees have been planted, and they seem to be doing well. First we went down to Pier 21 (I will put the links just in case you are ever planning a trip to Galveston, but otherwise you really don’t need to click them). This is a nice open area that has a lot of restaurants, and two museums – our tall ship Elissa, and the offshore drilling museum. It’s an easy-access spot where I can reliably find seabirds to photograph, and on this occasion we saw dolphins too! although I didn’t get any pictures of them. 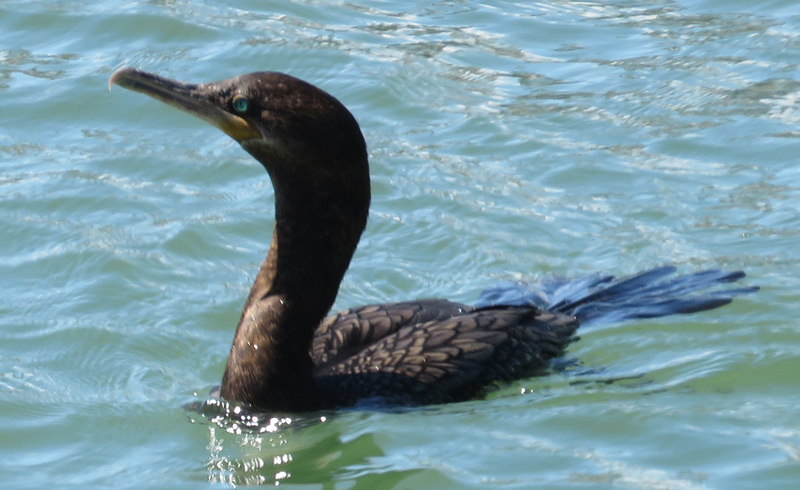 Double-Crested and Neotropic Cormorants look very much alike. I am identifying this one as a Neotropic based on two features – the area where its bill meet its feathers is pointy instead of rounded, and it has dark lores instead of orange ones. 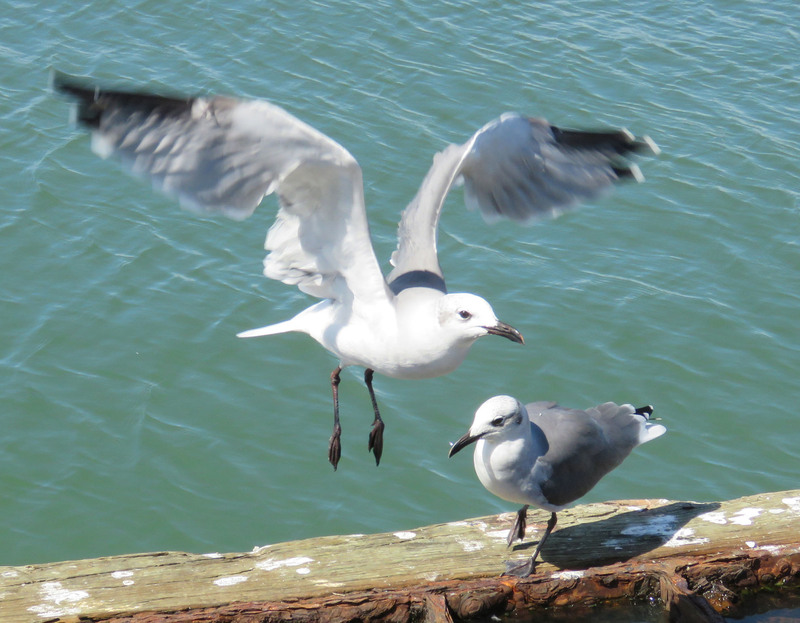 We have 8 gull species in Texas. Laughing gulls have a droopy tip to their bills, and what I think of as a sort of scimitar curve on the bottom of the bill. NOAA research vessel Oregon II. 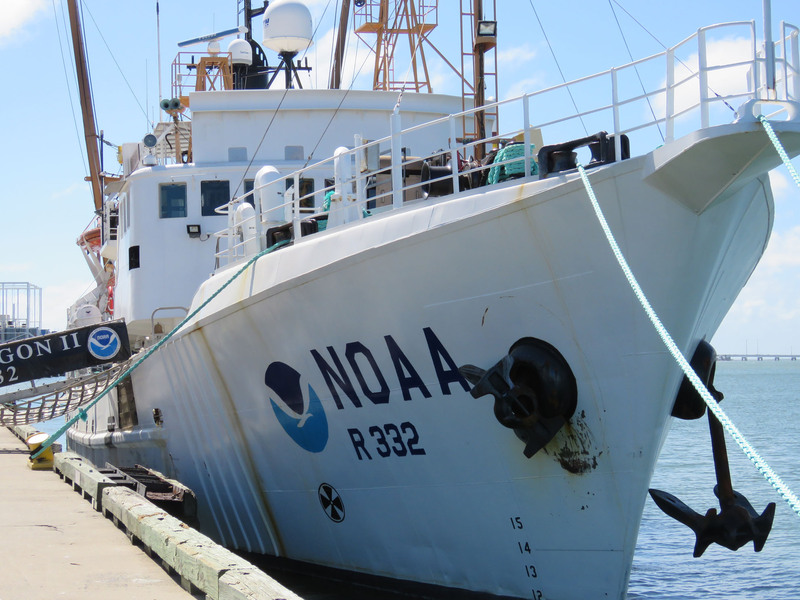 We also saw this NOAA research vessel. It had a sign that said it collects and studies fish, fish larva, eggs, crustaceans, and plankton, in the Gulf of Mexico, Atlantic, and Caribbean. Very cool. I would have loved to go aboard and find out about their work, but I’m sure they had work to do, and their mention of crustaceans reminded me that there was a plate of fried shrimp waiting for me at Gaido’s. The next day I spent some time walking around the grounds of Moody Gardens. They have a big rainforest pyramid and an aquarium – the aquarium was closed for repairs, and I didn’t have time to go into the rainforest pyramid either, but the grounds are extensively landscaped, and I found a lot of wonderful creatures to photograph. 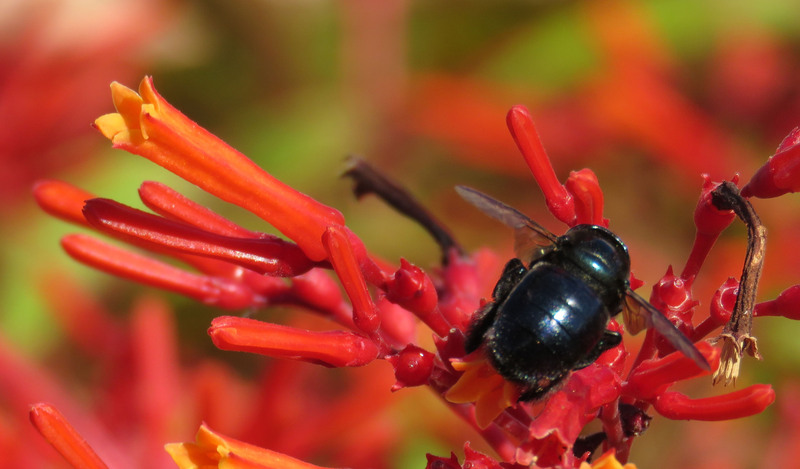 The carpenter bees we have on the farm have yellow thoraxes – this bee was all black, but I think it is a carpenter bee too. I have read that since they are too big to get into flowers to get the nectar, they go to the back of the bloom and cut into it to get the nectar that way. That seems to be what this bee is doing — I with I had paid more attention to know for sure. Carpenter bee (I think) on hummingbird bush. 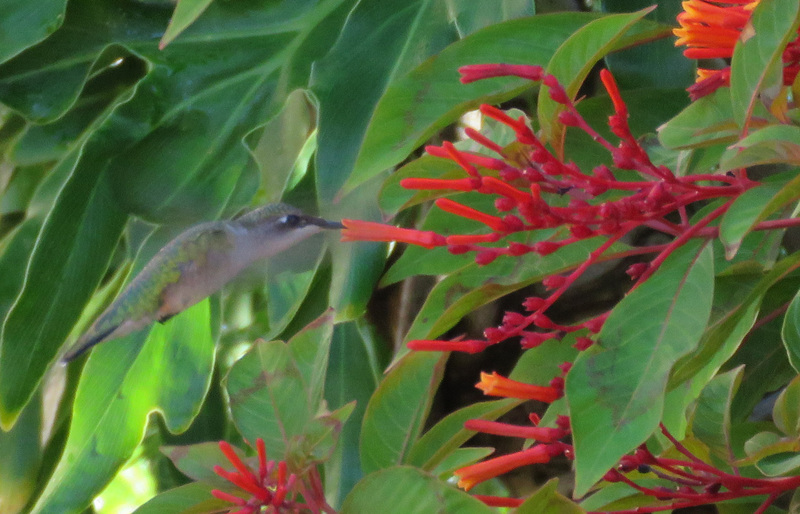 There were plenty of hummingbirds. I am pretty sure that all the ones I saw were either juvenile or female ruby-throated hummingbirds. Ruby-throated hummingbird female with hummingbird bush, Hamelia patens. 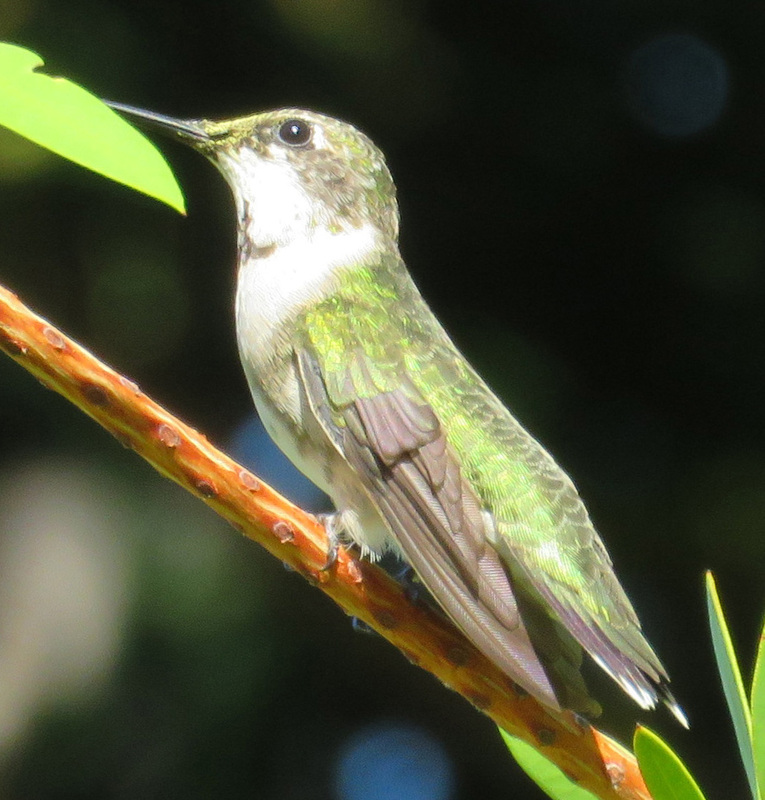 Ruby-throated Hummingbird sub-adult. I am pretty sure. 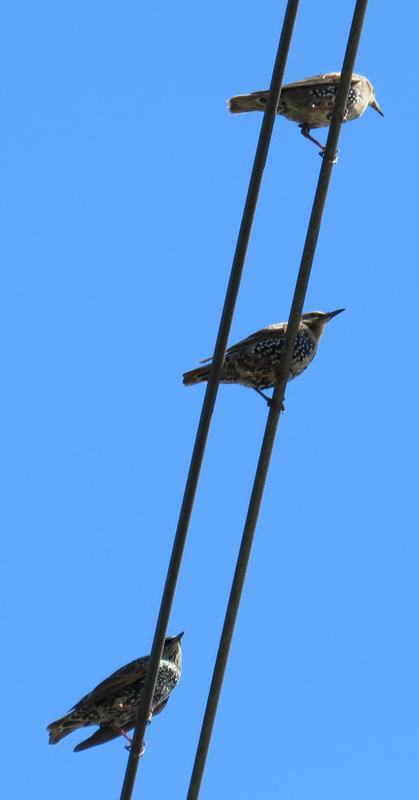 This is a bird I have never seen at home, European starling — there were about 100 flying around and around. 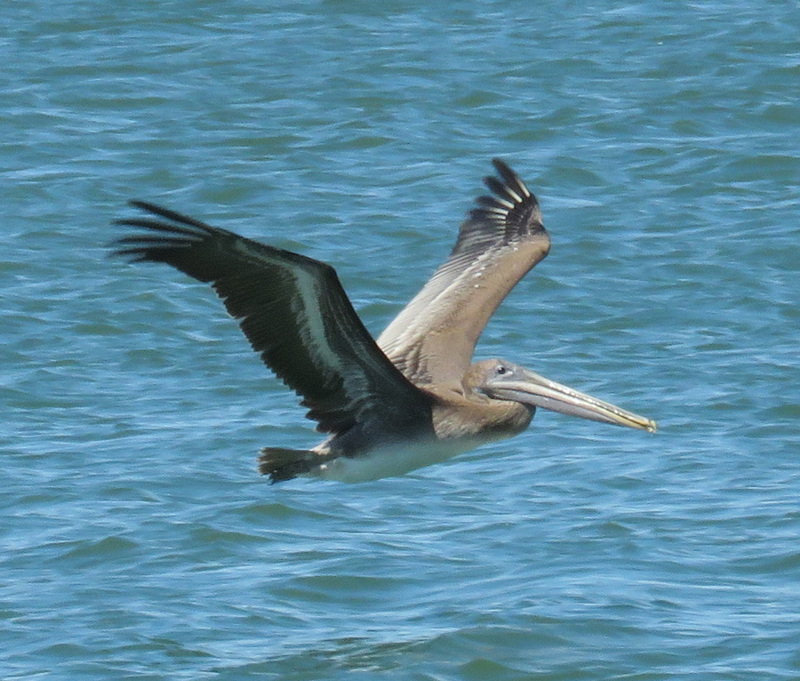 I liked this picture that showed 3 different patterns as the juveniles molt into adult plumage. 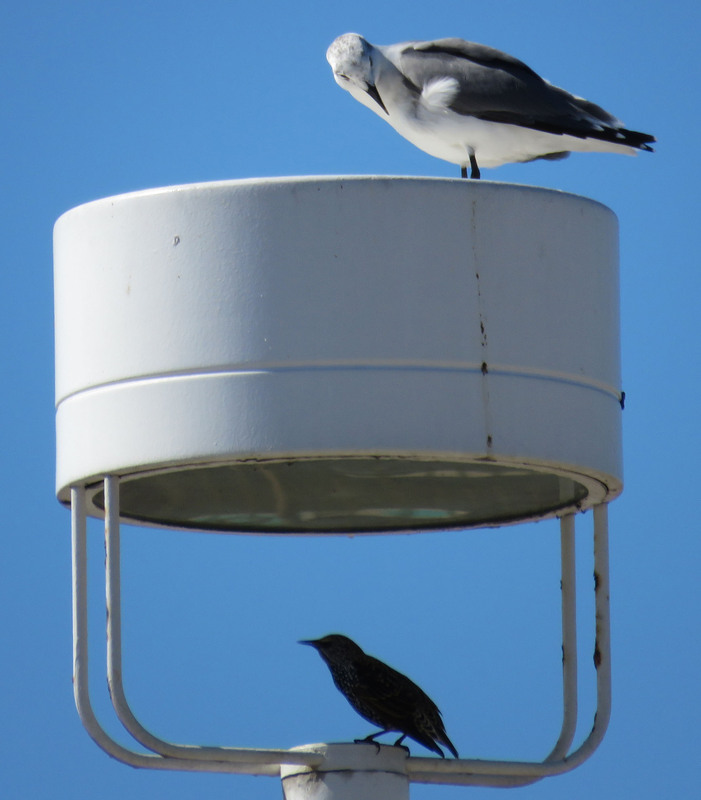 In the parking lot, I saw this pairing in almost every one of the light fixtures – a gull on top and a starling under cover. Unlike the big flock of starlings I saw in the landscaped area, the ones in the light fixtures didn’t fly around; they just stayed in their shady shelters. Gull and starling, at home in a parking lot light fixture. I also saw four Monarch butterflies. I tried to get pictures, hoping that I would see that they had been tagged, but they were too quick for me. Not bad for a 24-hour visit. As always, if you know that I have mis-identified anything, please let me know! *This fact comes from Birds of Texas by Keith A. Arnold and Gregory Kennedy, 2007, Lone Pine Publishing International. Definitely not bad for a 24 hour visit 🙂 sounds like you had an amazing day. We would love to spend more time in a lot of Galveston’s attractions, but we are pretty good about limiting our time so we can sample more activities, if we have to. 🙂 I did take the full amount of time possible for lunch at Gaido’s though – since I know you have said you love good food! As much as I enjoy your textiles posts, I know I’ll love your nature posts. I always have. 🙂 Great idea to devote a blog to them.